Priority Blocking Queue wait for the queue to become non-empty when retrieving an element, and wait for space to become available in the queue when storing an element which is not there in Priority Queue. 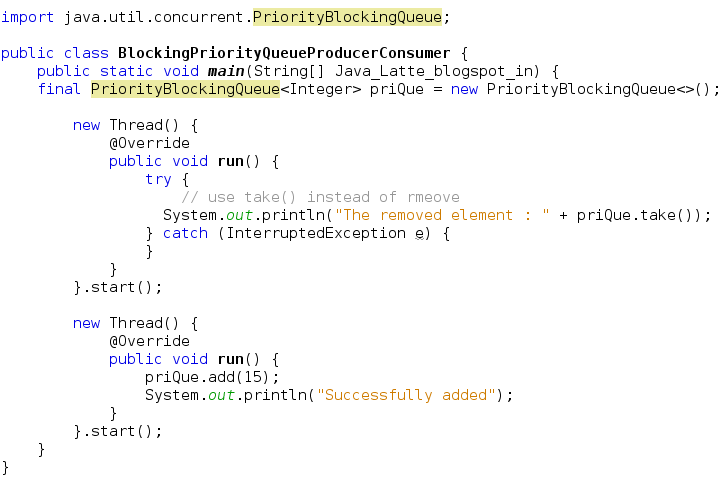 In this post, we'll how to use PriorityBlockingQueue with examples. In the following diagram, there is waiting room for 5 people. When it is occupied with 5 people, then 6th person will wait until any one of move of the room. This interface extends the Queue interface. In BlockingQueue, if the queue is empty it waits (i.e., blocks) for an element to be inserted, and if the queue is full, it waits for an element to be removed from the queue. In Queue interface, there was methods like add(e), offer(e), remove(), poll() with different ways of handling operations that cannot be satisfied immediately, but may be satisfied at some point in the future: one throws an exception, the second returns a special value (either null or false, depending on the operation). But, in BlockingQueue<E> there are other extra two forms. Examine element() peek() N.A. N.A. A BlockingQueue may be capacity bounded. At any given time it may have a remainingCapacity beyond which no additional elements can be put without blocking. A BlockingQueue without any intrinsic capacity constraints always reports a remaining capacity of Integer.MAX_VALUE. BlockingQueue implementations are designed to be used primarily for producer-consumer queues,but additionally support the Collection interface. So, for example, it is possible to remove an arbitrary element from a queue using remove(x). However, such operations are in general not performed very efficiently, and are intended for only occasional use, such as when a queued message is cancelled. The bulk Collection operations addAll, containsAll, retainAll and removeAll are not necessarily performed atomically unless specified otherwise in an implementation. So it is possible, for example, for addAll(c) to fail (throwing an exception) after adding only some of the elements in c.
Simply to say "Equivalent to java.util.PriorityQueue, but implements the BlockingQueue interface". This queue is logically unbounded, attempted additions may fail due to resource exhaustion (causing OutOfMemoryError). A priority queue relying on natural ordering also does not permit insertion of non-comparable objects (doing so results in ClassCastException). The Iterator provided in method iterator() is not guaranteed to traverse the elements of the PriorityBlockingQueue in any particular order. If you need ordered traversal, consider using Arrays.sort(pq.toArray()). Operations on this class make no guarantees about the ordering of elements with equal priority. If you need to enforce an ordering, you can define custom classes or comparators that use a secondary key to break ties in primary priority values. If you notice, most of the properties are similar to PriorityQueue. As I said above is that PriorityBlockingQueue used primarily for producer-consumer queues, now we the the same with the help of example. In this code, we create two threads in which one thread inserts the value and other thread removes the values from the priorityQueue. The above output indicate that first thread attempted removing an element from an empty queue, and hence it results in a Exception. In this code, take() method will block until an element gets inserted by another thread, once inserted, the take() method() will return the value. If you know anyone who has started learning Java, why not help them out! Just share this post with them. 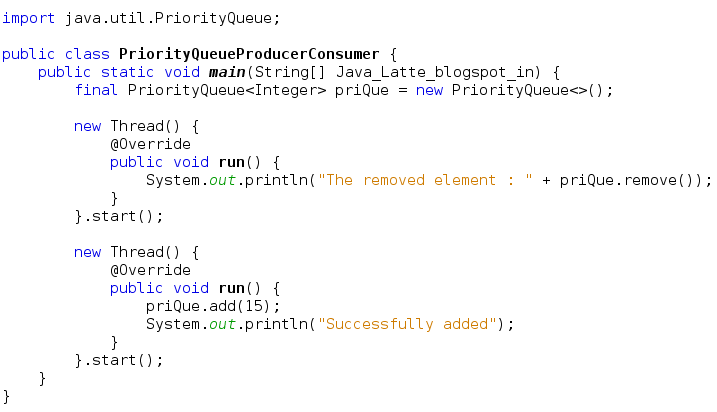 Main feature of the PriorityBlockingQueue in Java is that the elements in this queue can be prioritized. The elements of the PriorityBlockingQueue are ordered according to their natural ordering, or by a Comparator.